Soil erosion is the displacement of the upper layer of soil, one form of soil degradation. This natural process is caused by the dynamic activity of erosive agents, that is, water, ice (glaciers), snow, air (wind), plants, animals, and humans. In accordance with these agents, erosion is sometimes divided into water erosion, glacial erosion, snow erosion, wind (aeolean) erosion, zoogenic erosion, and anthropogenic erosion. Soil erosion may be a slow process that continues relatively unnoticed, or it may occur at an alarming rate causing a serious loss of topsoil. The loss of soil from farmland may be reflected in reduced crop production potential, lower surface water quality and damaged drainage networks. Human activities have increased by 10–40 times the rate at which erosion is occurring globally. Excessive (or accelerated) erosion causes both "on-site" and "off-site" problems. On-site impacts include decreases in agricultural productivity and (on natural landscapes) ecological collapse, both because of loss of the nutrient-rich upper soil layers. In some cases, the eventual end result is desertification. Off-site effects include sedimentation of waterways and eutrophication of water bodies, as well as sediment-related damage to roads and houses. Water and wind erosion are the two primary causes of land degradation; combined, they are responsible for about 84% of the global extent of degraded land, making excessive erosion one of the most significant environmental problems worldwide. Intensive agriculture, deforestation, roads, anthropogenic climate change and urban sprawl are amongst the most significant human activities in regard to their effect on stimulating erosion. However, there are many prevention and remediation practices that can curtail or limit erosion of vulnerable soils. Soil and water being splashed by the impact of a single raindrop. Rainfall, and the surface runoff which may result from rainfall, produces four main types of soil erosion: splash erosion, sheet erosion, rill erosion, and gully erosion. Splash erosion is generally seen as the first and least severe stage in the soil erosion process, which is followed by sheet erosion, then rill erosion and finally gully erosion (the most severe of the four). 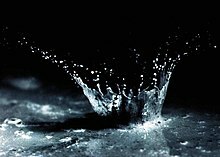 In splash erosion, the impact of a falling raindrop creates a small crater in the soil, ejecting soil particles. The distance these soil particles travel can be as much as 0.6 m (two feet) vertically and 1.5 m (five feet) horizontally on level ground. If the soil is saturated, or if the rainfall rate is greater than the rate at which water can infiltrate into the soil, surface runoff occurs. If the runoff has sufficient flow energy, it will transport loosened soil particles (sediment) down the slope. Sheet erosion is the transport of loosened soil particles by overland flow. Rill erosion refers to the development of small, ephemeral concentrated flow paths which function as both sediment source and sediment delivery systems for erosion on hillslopes. Generally, where water erosion rates on disturbed upland areas are greatest, rills are active. Flow depths in rills are typically of the order of a few centimeters (about an inch) or less and along-channel slopes may be quite steep. This means that rills exhibit hydraulic physics very different from water flowing through the deeper, wider channels of streams and rivers. Gully erosion occurs when runoff water accumulates and rapidly flows in narrow channels during or immediately after heavy rains or melting snow, removing soil to a considerable depth. Dobbingstone Burn, Scotland—This photo illustrates two different types of erosion affecting the same place. Valley erosion is occurring due to the flow of the stream, and the boulders and stones (and much of the soil) that are lying on the edges are glacial till that was left behind as ice age glaciers flowed over the terrain. Valley or stream erosion occurs with continued water flow along a linear feature. The erosion is both downward, deepening the valley, and headward, extending the valley into the hillside, creating head cuts and steep banks. In the earliest stage of stream erosion, the erosive activity is dominantly vertical, the valleys have a typical V cross-section and the stream gradient is relatively steep. When some base level is reached, the erosive activity switches to lateral erosion, which widens the valley floor and creates a narrow floodplain. The stream gradient becomes nearly flat, and lateral deposition of sediments becomes important as the stream meanders across the valley floor. In all stages of stream erosion, by far the most erosion occurs during times of flood, when more and faster-moving water is available to carry a larger sediment load. In such processes, it is not the water alone that erodes: suspended abrasive particles, pebbles and boulders can also act erosively as they traverse a surface, in a process known as traction. Bank erosion is the wearing away of the banks of a stream or river. This is distinguished from changes on the bed of the watercourse, which is referred to as scour. Erosion and changes in the form of river banks may be measured by inserting metal rods into the bank and marking the position of the bank surface along the rods at different times. Thermal erosion is the result of melting and weakening permafrost due to moving water. It can occur both along rivers and at the coast. Rapid river channel migration observed in the Lena River of Siberia is due to thermal erosion, as these portions of the banks are composed of permafrost-cemented non-cohesive materials. Much of this erosion occurs as the weakened banks fail in large slumps. Thermal erosion also affects the Arctic coast, where wave action and near-shore temperatures combine to undercut permafrost bluffs along the shoreline and cause them to fail. Annual erosion rates along a 100-kilometre (62-mile) segment of the Beaufort Sea shoreline averaged 5.6 metres (18 feet) per year from 1955 to 2002. At extremely high flows, kolks, or vortices are formed by large volumes of rapidly rushing water. Kolks cause extreme local erosion, plucking bedrock and creating pothole-type geographical features called Rock-cut basins. Examples can be seen in the flood regions result from glacial Lake Missoula, which created the channeled scablands in the Columbia Basin region of eastern Washington. 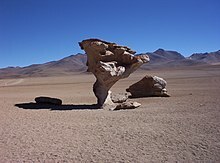 Árbol de Piedra, a rock formation in the Altiplano, Bolivia sculpted by wind erosion. Wind erosion is a major geomorphological force, especially in arid and semi-arid regions. It is also a major source of land degradation, evaporation, desertification, harmful airborne dust, and crop damage—especially after being increased far above natural rates by human activities such as deforestation, urbanization, and agriculture. Wind erosion is of two primary varieties: deflation, where the wind picks up and carries away loose particles; and abrasion, where surfaces are worn down as they are struck by airborne particles carried by wind. Deflation is divided into three categories: (1) surface creep, where larger, heavier particles slide or roll along the ground; (2) saltation, where particles are lifted a short height into the air, and bounce and saltate across the surface of the soil; and (3) suspension, where very small and light particles are lifted into the air by the wind, and are often carried for long distances. Saltation is responsible for the majority (50–70%) of wind erosion, followed by suspension (30–40%), and then surface creep (5–25%). Silty soils tend to be the most affected by wind erosion; silt particles are relatively easily detached and carried away. Wind erosion is much more severe in arid areas and during times of drought. For example, in the Great Plains, it is estimated that soil loss due to wind erosion can be as much as 6100 times greater in drought years than in wet years. Wadi in Makhtesh Ramon, Israel, showing gravity collapse erosion on its banks. Mass movement is the downward and outward movement of rock and sediments on a sloped surface, mainly due to the force of gravity. much more detailed way that reflects the mechanisms responsible for the movement and the velocity at which the movement occurs. One of the visible topographical manifestations of a very slow form of such activity is a scree slope. Slumping happens on steep hillsides, occurring along distinct fracture zones, often within materials like clay that, once released, may move quite rapidly downhill. They will often show a spoon-shaped isostatic depression, in which the material has begun to slide downhill. In some cases, the slump is caused by water beneath the slope weakening it. In many cases it is simply the result of poor engineering along highways where it is a regular occurrence. Surface creep is the slow movement of soil and rock debris by gravity which is usually not perceptible except through extended observation. However, the term can also describe the rolling of dislodged soil particles 0.5 to 1.0 mm (0.02 to 0.04 in) in diameter by wind along the soil surface. The amount and intensity of precipitation is the main climatic factor governing soil erosion by water. The relationship is particularly strong if heavy rainfall occurs at times when, or in locations where, the soil's surface is not well protected by vegetation. This might be during periods when agricultural activities leave the soil bare, or in semi-arid regions where vegetation is naturally sparse. Wind erosion requires strong winds, particularly during times of drought when vegetation is sparse and soil is dry (and so is more erodible). Other climatic factors such as average temperature and temperature range may also affect erosion, via their effects on vegetation and soil properties. In general, given similar vegetation and ecosystems, areas with more precipitation (especially high-intensity rainfall), more wind, or more storms are expected to have more erosion. In some areas of the world (e.g. the mid-western USA), rainfall intensity is the primary determinant of erosivity, with higher intensity rainfall generally resulting in more soil erosion by water. The size and velocity of rain drops is also an important factor. Larger and higher-velocity rain drops have greater kinetic energy, and thus their impact will displace soil particles by larger distances than smaller, slower-moving rain drops. In other regions of the world (e.g. western Europe), runoff and erosion result from relatively low intensities of stratiform rainfall falling onto previously saturated soil. In such situations, rainfall amount rather than intensity is the main factor determining the severity of soil erosion by water. Erosional gully in unconsolidated Dead Sea (Israel) sediments along the southwestern shore. This gully was excavated by floods from the Judean Mountains in less than a year. The composition, moisture, and compaction of soil are all major factors in determining the erosivity of rainfall. Sediments containing more clay tend to be more resistant to erosion than those with sand or silt, because the clay helps bind soil particles together. Soil containing high levels of organic materials are often more resistant to erosion, because the organic materials coagulate soil colloids and create a stronger, more stable soil structure. The amount of water present in the soil before the precipitation also plays an important role, because it sets limits on the amount of water that can be absorbed by the soil (and hence prevented from flowing on the surface as erosive runoff). Wet, saturated soils will not be able to absorb as much rain water, leading to higher levels of surface runoff and thus higher erosivity for a given volume of rainfall. Soil compaction also affects the permeability of the soil to water, and hence the amount of water that flows away as runoff. More compacted soils will have a larger amount of surface runoff than less compacted soils. Vegetation acts as an interface between the atmosphere and the soil. It increases the permeability of the soil to rainwater, thus decreasing runoff. It shelters the soil from winds, which results in decreased wind erosion, as well as advantageous changes in microclimate. The roots of the plants bind the soil together, and interweave with other roots, forming a more solid mass that is less susceptible to both water and wind erosion. The removal of vegetation increases the rate of surface erosion. The topography of the land determines the velocity at which surface runoff will flow, which in turn determines the erosivity of the runoff. Longer, steeper slopes (especially those without adequate vegetative cover) are more susceptible to very high rates of erosion during heavy rains than shorter, less steep slopes. Steeper terrain is also more prone to mudslides, landslides, and other forms of gravitational erosion processes. Tilled farmland such as this is very susceptible to erosion from rainfall, due to the destruction of vegetative cover and the loosening of the soil during plowing. Unsustainable agricultural practices are the single greatest contributor to the global increase in erosion rates. The tillage of agricultural lands, which breaks up soil into finer particles, is one of the primary factors. The problem has been exacerbated in modern times, due to mechanized agricultural equipment that allows for deep plowing, which severely increases the amount of soil that is available for transport by water erosion. Others include mono-cropping, farming on steep slopes, pesticide and chemical fertilizer usage (which kill organisms that bind soil together), row-cropping, and the use of surface irrigation. A complex overall situation with respect to defining nutrient losses from soils, could arise as a result of the size selective nature of soil erosion events. Loss of total phosphorus, for instance, in the finer eroded fraction is greater relative to the whole soil. Extrapolating this evidence to predict subsequent behaviour within receiving aquatic systems, the reason is that this more easily transported material may support a lower solution P concentration compared to coarser sized fractions. Tillage also increases wind erosion rates, by dehydrating the soil and breaking it up into smaller particles that can be picked up by the wind. Exacerbating this is the fact that most of the trees are generally removed from agricultural fields, allowing winds to have long, open runs to travel over at higher speeds. Heavy grazing reduces vegetative cover and causes severe soil compaction, both of which increase erosion rates. In this clearcut, almost all of the vegetation has been stripped from surface of steep slopes, in an area with very heavy rains. Severe erosion occurs in cases such as this, causing stream sedimentation and the loss of nutrient rich topsoil. In an undisturbed forest, the mineral soil is protected by a layer of leaf litter and an humus that cover the forest floor. These two layers form a protective mat over the soil that absorbs the impact of rain drops. They are porous and highly permeable to rainfall, and allow rainwater to slow percolate into the soil below, instead of flowing over the surface as runoff. The roots of the trees and plants hold together soil particles, preventing them from being washed away. The vegetative cover acts to reduce the velocity of the raindrops that strike the foliage and stems before hitting the ground, reducing their kinetic energy. However it is the forest floor, more than the canopy, that prevents surface erosion. The terminal velocity of rain drops is reached in about 8 metres (26 feet). Because forest canopies are usually higher than this, rain drops can often regain terminal velocity even after striking the canopy. However, the intact forest floor, with its layers of leaf litter and organic matter, is still able to absorb the impact of the rainfall. Deforestation causes increased erosion rates due to exposure of mineral soil by removing the humus and litter layers from the soil surface, removing the vegetative cover that binds soil together, and causing heavy soil compaction from logging equipment. Once trees have been removed by fire or logging, infiltration rates become high and erosion low to the degree the forest floor remains intact. Severe fires can lead to significant further erosion if followed by heavy rainfall. Globally one of the largest contributors to erosive soil loss in the year 2006 is the slash and burn treatment of tropical forests. In a number of regions of the earth, entire sectors of a country have been rendered unproductive. For example, on the Madagascar high central plateau, comprising approximately ten percent of that country's land area, virtually the entire landscape is sterile of vegetation, with gully erosive furrows typically in excess of 50 metres (160 ft) deep and 1 kilometre (0.6 miles) wide. Shifting cultivation is a farming system which sometimes incorporates the slash and burn method in some regions of the world. This degrades the soil and causes the soil to become less and less fertile. Urbanization has major effects on erosion processes—first by denuding the land of vegetative cover, altering drainage patterns, and compacting the soil during construction; and next by covering the land in an impermeable layer of asphalt or concrete that increases the amount of surface runoff and increases surface wind speeds. Much of the sediment carried in runoff from urban areas (especially roads) is highly contaminated with fuel, oil, and other chemicals. This increased runoff, in addition to eroding and degrading the land that it flows over, also causes major disruption to surrounding watersheds by altering the volume and rate of water that flows through them, and filling them with chemically polluted sedimentation. The increased flow of water through local waterways also causes a large increase in the rate of bank erosion. The warmer atmospheric temperatures observed over the past decades are expected to lead to a more vigorous hydrological cycle, including more extreme rainfall events. The rise in sea levels that has occurred as a result of climate change has also greatly increased coastal erosion rates. Studies on soil erosion suggest that increased rainfall amounts and intensities will lead to greater rates of soil erosion. Thus, if rainfall amounts and intensities increase in many parts of the world as expected, erosion will also increase, unless amelioration measures are taken. Soil erosion rates are expected to change in response to changes in climate for a variety of reasons. The most direct is the change in the erosive power of rainfall. Other reasons include: a) changes in plant canopy caused by shifts in plant biomass production associated with moisture regime; b) changes in litter cover on the ground caused by changes in both plant residue decomposition rates driven by temperature and moisture dependent soil microbial activity as well as plant biomass production rates; c) changes in soil moisture due to shifting precipitation regimes and evapo-transpiration rates, which changes infiltration and runoff ratios; d) soil erodibility changes due to decrease in soil organic matter concentrations in soils that lead to a soil structure that is more susceptible to erosion and increased runoff due to increased soil surface sealing and crusting; e) a shift of winter precipitation from non-erosive snow to erosive rainfall due to increasing winter temperatures; f) melting of permafrost, which induces an erodible soil state from a previously non-erodible one; and g) shifts in land use made necessary to accommodate new climatic regimes. Studies by Pruski and Nearing indicated that, other factors such as land use unconsidered, it is reasonable to expect approximately a 1.7% change in soil erosion for each 1% change in total precipitation under climate change. In recent studies, there are predicted increases of rainfall erosivity by 17% in the United States and by 18% in Europe. 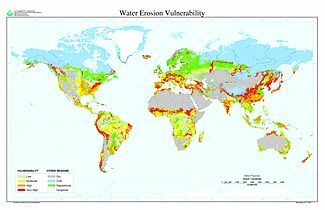 World map indicating areas that are vulnerable to high rates of water erosion. During the 17th and 18th centuries, Easter Island experienced severe erosion due to deforestation and unsustainable agricultural practices. The resulting loss of topsoil ultimately led to ecological collapse, causing mass starvation and the complete disintegration of the Easter Island civilization. Due to the severity of its ecological effects, and the scale on which it is occurring, erosion constitutes one of the most significant global environmental problems we face today. Water and wind erosion are now the two primary causes of land degradation; combined, they are responsible for 84% of degraded acreage. Each year, about 75 billion tons of soil is eroded from the land—a rate that is about 13–40 times as fast as the natural rate of erosion. Approximately 40% of the world's agricultural land is seriously degraded. According to the United Nations, an area of fertile soil the size of Ukraine is lost every year because of drought, deforestation and climate change. In Africa, if current trends of soil degradation continue, the continent might be able to feed just 25% of its population by 2025, according to UNU's Ghana-based Institute for Natural Resources in Africa. Recent modeling developments have quantified rainfall erosivity at global scale using high temporal resolution(<30 min) and high fidelity rainfall recordings. The results is an extensive global data collection effort produced the Global Rainfall Erosivity Database (GloREDa) which includes rainfall erosivity for 3,625 stations and covers 63 countries. This first ever Global Rainfall Erosivity Database was used to develop a global erosivity map  at 30 arc-seconds(~1 km) based on sophisticated geostatistical process. According to a new study published in Nature Communications, almost 36 billion tons of soil is lost every year due to water, and deforestation and other changes in land use make the problem worse. The study investigates global soil erosion dynamics by means of high-resolution spatially distributed modelling (ca. 250 × 250 m cell size). The geo-statistical approach allows, for the first time, the thorough incorporation into a global soil erosion model of land use and changes in land use, the extent, types, spatial distribution of global croplands and the effects of different regional cropping systems. The loss of soil fertility due to erosion is further problematic because the response is often to apply chemical fertilizers, which leads to further water and soil pollution, rather than to allow the land to regenerate. Soil erosion (especially from agricultural activity) is considered to be the leading global cause of diffuse water pollution, due to the effects of the excess sediments flowing into the world's waterways. The sediments themselves act as pollutants, as well as being carriers for other pollutants, such as attached pesticide molecules or heavy metals. The effect of increased sediments loads on aquatic ecosystems can be catastrophic. Silt can smother the spawning beds of fish, by filling in the space between gravel on the stream bed. It also reduces their food supply, and causes major respiratory issues for them as sediment enters their gills. The biodiversity of aquatic plant and algal life is reduced, and invertebrates are also unable to survive and reproduce. While the sedimentation event itself might be relatively short-lived, the ecological disruption caused by the mass die off often persists long into the future. One of the most serious and long-running water erosion problems worldwide is in the People's Republic of China, on the middle reaches of the Yellow River and the upper reaches of the Yangtze River. From the Yellow River, over 1.6 billion tons of sediment flows into the ocean each year. The sediment originates primarily from water erosion in the Loess Plateau region of the northwest. Soil particles picked up during wind erosion of soil are a major source of air pollution, in the form of airborne particulates—"dust". These airborne soil particles are often contaminated with toxic chemicals such as pesticides or petroleum fuels, posing ecological and public health hazards when they later land, or are inhaled/ingested. Dust from erosion acts to suppress rainfall and changes the sky color from blue to white, which leads to an increase in red sunsets. Dust events have been linked to a decline in the health of coral reefs across the Caribbean and Florida, primarily since the 1970s. Similar dust plumes originate in the Gobi desert, which combined with pollutants, spread large distances downwind, or eastward, into North America. Terracing is an ancient technique that can significantly slow the rate of water erosion on cultivated slopes. Monitoring and modeling of erosion processes can help people better understand the causes of soil erosion, make predictions of erosion under a range of possible conditions, and plan the implementation of preventative and restorative strategies for erosion. However, the complexity of erosion processes and the number of scientific disciplines that must be considered to understand and model them (e.g. climatology, hydrology, geology, soil science, agriculture, chemistry, physics, etc.) makes accurate modelling challenging. Erosion models are also non-linear, which makes them difficult to work with numerically, and makes it difficult or impossible to scale up to making predictions about large areas from data collected by sampling smaller plots. where R is the rainfall erosivity factor, K is the soil erodibility factor, L and S are topographic factors representing length and slope, C is the cover and management factor and P is the support practices factor. Despite the USLE's plot-scale spatial focus, the model has often been used to estimate soil erosion on much larger areas, such as watersheds or even whole continents. For example, RUSLE has recently been used to quantify soil erosion across the whole of Europe. One major problem is that the USLE cannot simulate gully erosion, and so erosion from gullies is ignored in any USLE-based assessment of erosion. Yet erosion from gullies can be a substantial proportion (10–80%) of total erosion on cultivated and grazed land. During the 50 years since the introduction of the USLE, many other soil erosion models have been developed. But because of the complexity of soil erosion and its constituent processes, all erosion models can give unsatisfactory results when validated i.e. when model predictions are compared with real-world measurements of erosion. Thus new soil erosion models continue to be developed. Some of these remain USLE-based, e.g. the G2 model. Other soil erosion models have largely (e.g. the Water Erosion Prediction Project model) or wholly (e.g. the Rangeland Hydrology and Erosion Model ) abandoned usage of USLE elements. A windbreak (the row of trees) planted next to an agricultural field, acting as a shield against strong winds. This reduces the effects of wind erosion, and provides many other benefits. The most effective known method for erosion prevention is to increase vegetative cover on the land, which helps prevent both wind and water erosion. Terracing is an extremely effective means of erosion control, which has been practiced for thousands of years by people all over the world. Windbreaks (also called shelterbelts) are rows of trees and shrubs that are planted along the edges of agricultural fields, to shield the fields against winds. In addition to significantly reducing wind erosion, windbreaks provide many other benefits such as improved microclimates for crops (which are sheltered from the dehydrating and otherwise damaging effects of wind), habitat for beneficial bird species, carbon sequestration, and aesthetic improvements to the agricultural landscape. Traditional planting methods, such as mixed-cropping (instead of monocropping) and crop rotation have also been shown to significantly reduce erosion rates. Crop residues play a role in the mitigation of erosion, because they reduce the impact of raindrops breaking up the soil particles. There is a higher potential for erosion when producing potatoes than when growing cereals, or oilseed crops. Forages have a fibrous root system, which helps combat erosion by anchoring the plants to the top layer of the soil, and covering the entirety of the field, as it is a non-row crop. In tropical coastal systems, properties of mangroves have been examined as a potential means to reduce soil erosion. Their complex root structures are known to help reduce wave damage from storms and flood impacts while binding and building soils. 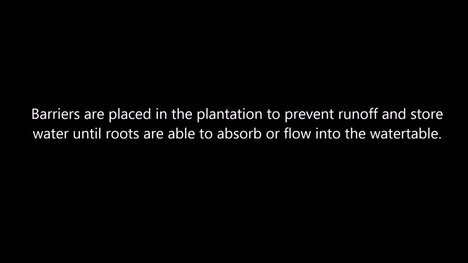 These roots can slow down water flow, leading to the deposition of sediments and reduced erosion rates. However, in order to maintain sediment balance, adequate mangrove forest width needs to be present. ^ a b Blanco, Humberto & Lal, Rattan (2010). "Soil and water conservation". Principles of Soil Conservation and Management. Springer. p. 2. ISBN 978-90-481-8529-0. ^ a b Toy, Terrence J.; et al. (2002). Soil Erosion: Processes, Prediction, Measurement, and Control. John Wiley & Sons. p. 1. ISBN 978-0-471-38369-7. ^ Julien, Pierre Y. (2010). Erosion and Sedimentation. Cambridge University. (Press. p. 1. ISBN 978-0-521-53737-7. ^ Toy, Terrence J.; et al. (2002). Soil Erosion: Processes, Prediction, Measurement, and Control. John Wiley & Sons. pp. 60–61. ISBN 978-0-471-38369-7. ^ Zachar, Dušan (1982). "Classification of soil erosion". Soil Erosion. Vol. 10. Elsevier. p. 48. ISBN 978-0-444-99725-8. ^ See figure 4 in Obreschkow (2011). "Confined Shocks inside Isolated Liquid Volumes – A New Path of Erosion?". Physics of Fluids. 23 (10): 101702. arXiv:1109.3175. Bibcode:2011PhFl...23j1702O. doi:10.1063/1.3647583. ^ a b Food and Agriculture Organization (1965). "Types of erosion damage". Soil Erosion by Water: Some Measures for Its Control on Cultivated Lands. United Nations. pp. 23–25. ISBN 978-92-5-100474-6. ^ Nearing, M.A. ; Norton, L.D. ; Bulgakov, D.A. ; Larionov, G.A. ; West, L.T. ; Dontsova, K.M. (1997). "Hydraulics and erosion in eroding rills". Water Resources Research. 33 (4): 865–876. Bibcode:1997WRR....33..865N. doi:10.1029/97wr00013. ^ Poesen, Jean; et al. (2007). "Gully erosion in Europe". In Boardman, John; Poesen, Jean (eds.). Soil Erosion in Europe. John Wiley & Sons. pp. 516–519. ISBN 978-0-470-85911-7. ^ Poesen, Jean; et al. (2002). "Gully erosion in dryland environments". In Bull, Louise J.; Kirby, M.J. (eds.). Dryland Rivers: Hydrology and Geomorphology of Semi-Arid Channels. John Wiley & Sons. ISBN 978-0-471-49123-1. ^ Borah, Deva K.; et al. (2008). "Watershed sediment yield". In Garcia, Marcelo H. (ed.). Sedimentation Engineering: Processes, Measurements, Modeling, and Practice. ASCE Publishing. p. 828. ISBN 978-0-7844-0814-8. ^ Nancy D. Gordon (2004-06-01). "Erosion and Scour". Stream hydrology: an introduction for ecologists. ISBN 978-0-470-84357-4. ^ "Thermal Erosion". NSIDC Glossary. National Snow and Ice Data Center. Archived from the original on 2010-11-19. Retrieved 21 December 2009. ^ Costard, F.; Dupeyrat, L.; Gautier, E.; Carey-Gailhardis, E. (2003). "Fluvial thermal erosion investigations along a rapidly eroding river bank: application to the Lena River (central Siberia)". Earth Surface Processes and Landforms. 28 (12): 1349–1359. Bibcode:2003ESPL...28.1349C. doi:10.1002/esp.592. ^ Jones, B.M. ; Hinkel, K.M. ; Arp, C.D. ; Eisner, W.R. (2008). "Modern Erosion Rates and Loss of Coastal Features and Sites, Beaufort Sea Coastline, Alaska". Arctic. 61 (4): 361–372. doi:10.14430/arctic44. Archived from the original on 2013-05-17. ^ See, for example: Alt, David (2001). Glacial Lake Missoula & its Humongous Floods. Mountain Press. ISBN 978-0-87842-415-3. ^ Zheng, Xiaojing & Huang, Ning (2009). Mechanics of Wind-Blown Sand Movements. Springer. pp. 7–8. ISBN 978-3-540-88253-4. ^ Cornelis, Wim S. (2006). "Hydroclimatology of wind erosion in arid and semi-arid environments". In D'Odorico, Paolo; Porporato, Amilcare (eds.). Dryland Ecohydrology. Springer. p. 141. ISBN 978-1-4020-4261-4. ^ Blanco, Humberto & Lal, Rattan (2010). "Wind erosion". Principles of Soil Conservation and Management. Springer. pp. 56–57. ISBN 978-90-481-8529-0. ^ Balba, A. Monem (1995). "Desertification: Wind erosion". Management of Problem Soils in Arid Ecosystems. CRC Press. p. 214. ISBN 978-0-87371-811-0. ^ Wiggs, Giles F.S. (2011). "Geomorphological hazards in drylands". In Thomas, David S.G. (ed.). Arid Zone Geomorphology: Process, Form and Change in Drylands. John Wiley & Sons. p. 588. ISBN 978-0-470-71076-0. ^ Van Beek, Rens (2008). "Hillside processes: mass wasting, slope stability, and erosion". In Norris, Joanne E.; et al. (eds.). Slope Stability and Erosion Control: Ecotechnological Solutions. Springer. ISBN 978-1-4020-6675-7. ^ Gray, Donald H. & Sotir, Robbin B. (1996). "Surficial erosion and mass movement". Biotechnical and Soil Bioengineering Slope Stabilization: A Practical Guide for Erosion Control. John Wiley & Sons. p. 20. ISBN 978-0-471-04978-4. ^ Nichols, Gary (2009). Sedimentology and Stratigraphy. John Wiley & Sons. p. 93. ISBN 978-1-4051-9379-5. ^ Blanco, Humberto & Lal, Rattan (2010). "Water erosion". Principles of Soil Conservation and Management. Springer. pp. 29–31. ISBN 978-90-481-8529-0. ^ Mirsal, Ibrahim A. (2008). "Soil degradation". Soil Pollution: Origin, Monitoring & Remediation. Springer. p. 100. ISBN 978-3-540-70775-2. ^ a b c Blanco, Humberto & Lal, Rattan (2010). "Water erosion". Principles of Soil Conservation and Management. Springer. p. 29. ISBN 978-90-481-8529-0. ^ Torri, D. (1996). "Slope, aspect and surface storage". In Agassi, Menachem (ed.). Soil Erosion, Conservation, and Rehabilitation. CRC Press. p. 95. ISBN 978-0-8247-8984-8. ^ Styczen, M.E. & Morgan, R.P.C. (1995). "Engineering properties of vegetation". In Morgan, R.P.C. & Rickson, R. Jane (eds.). Slope Stabilization and Erosion Control: A Bioengineering Approach. Taylor & Francis. ISBN 978-0-419-15630-7. ^ Whisenant, Steve G. (2008). "Terrestrial systems". In Perrow Michael R.; Davy, Anthony J. (eds.). Handbook of Ecological Restoration: Principles of Restoration. Cambridge University Press. p. 89. ISBN 978-0-521-04983-2. ^ Blanco, Humberto & Lal, Rattan (2010). "Water erosion". Principles of Soil Conservation and Management. Springer. pp. 28–30. ISBN 978-90-481-8529-0. ^ Wainwright, John & Brazier, Richard E. (2011). "Slope systems". In Thomas, David S.G. (ed.). Arid Zone Geomorphology: Process, Form and Change in Drylands. John Wiley & Sons. ISBN 978-0-470-71076-0. ^ Committee on 21st Century Systems Agriculture (2010). Toward Sustainable Agricultural Systems in the 21st Century. National Academies Press. ISBN 978-0-309-14896-2. ^ Blanco, Humberto & Lal, Rattan (2010). "Tillage erosion". Principles of Soil Conservation and Management. Springer. ISBN 978-90-481-8529-0. ^ Poirier, S.-C.; Whalen, J.K.; Michaud, A.R. (2012). "Bioavailable phosphorus in fine-sized sediments transported from agricultural fields". Soil Science Society of America Journal. 76 (1): 258–267. Bibcode:2012SSASJ..76..258P. doi:10.2136/sssaj2010.0441. ^ Scalenghe, R.; Edwards, A.C. & Barberis, E. (2007). "Phosphorus loss in overfertilized soils: The selective P partitioning and redistribution between particle size separates". European Journal of Agronomy. 27 (11): 72–80. doi:10.1016/j.eja.2007.02.002. ^ Whitford, Walter G. (2002). "Wind and water processes". Ecology of Desert Systems. Academic Press. p. 65. ISBN 978-0-12-747261-4. ^ Imeson, Anton (2012). "Human impact on degradation processes". Desertification, Land Degradation and Sustainability. John Wiley & Sons. p. 165. ISBN 978-1-119-97776-6. ^ a b Sands, Roger (2005). "The environmental value of forests". Forestry in a Global Context. CABI. pp. 74–75. ISBN 978-0-85199-089-7. ^ The mycelia of forest fungi also play a major role in binding soil particles together. ^ a b Goudie, Andrew (2000). "The human impact on the soil". The Human Impact on the Natural Environment. MIT Press. p. 188. ISBN 978-0-262-57138-8. ^ Stuart, Gordon W. & Edwards, Pamela J. (2006). "Concepts about forests and water". Northern Journal of Applied Forestry. 23 (1). ^ Goudie, Andrew (2000). "The human impact on the soil". The Human Impact on the Natural Environment. MIT Press. pp. 196–197. ISBN 978-0-262-57138-8. ^ Nîr, Dov (1983). Man, a Geomorphological Agent: An Introduction to Anthropic Geomorphology. Springer. pp. 121–122. ISBN 978-90-277-1401-5. ^ Randhir, Timothy O. (2007). Watershed Management: Issues and Approaches. IWA Publishing. p. 56. ISBN 978-1-84339-109-8. ^ James, William (1995). "Channel and habitat change downstream of urbanization". In Herricks, Edwin E.; Jenkins, Jackie R. (eds.). Stormwater Runoff and Receiving Systems: Impact, Monitoring, and Assessment. CRC Press. p. 105. ISBN 978-1-56670-159-4. ^ Intergovernmental Panel on Climate Change (IPCC) (1995). "Second Assessment Synthesis of Scientific-Technical Information relevant to interpreting Article 2 of the UN Framework Convention on Climate Change" (PDF). p. 5. ^ Bicknell, Jane; et al., eds. (2009). Adapting Cities to Climate Change: Understanding and Addressing the Development Challenges. Earthscan. p. 114. ISBN 978-1-84407-745-8. ^ For an overview of other human activities that have increased coastal erosion rates, see: Goudie, Andrew (2000). "Accelerated coastal erosion". The Human Impact on the Natural Environment. MIT Press. p. 311. ISBN 978-0-262-57138-8. ^ Pruski, F. F.; Nearing, M. A. (2002). "Runoff and soil loss responses to changes in precipitation: a computer simulation study". Journal of Soil and Water Conservation. 57 (1): 7–16. ^ Nearing, M. A.; Pruski, F. F.; O'Neal, M. R. (2004-01-01). "Expected climate change impacts on soil erosion rates: A review". Journal of Soil and Water Conservation. 59 (1): 43–50. ISSN 0022-4561. ^ Panagos, Panos; Ballabio, Cristiano; Meusburger, Katrin; Spinoni, Jonathan; Alewell, Christine; Borrelli, Pasquale (2017). "Towards estimates of future rainfall erosivity in Europe based on REDES and WorldClim datasets". Journal of Hydrology. 548: 251–262. Bibcode:2017JHyd..548..251P. doi:10.1016/j.jhydrol.2017.03.006. PMC 5473165. PMID 28649140. ^ Dangerfield, Whitney (April 1, 2007). "The Mystery of Easter Island". Smithsonian Magazine. ^ Montgomery, David (October 2, 2008). "Islands in time". Dirt: The Erosion of Civilizations (1st ed.). University of California Press. ISBN 978-0-520-25806-8. ^ Zuazo, Victor H.D. & Pleguezuelo, Carmen R.R. (2009). "Soil-erosion and runoff prevention by plant covers: a review". In Lichtfouse, Eric; et al. (eds.). Sustainable agriculture. Springer. p. 785. ISBN 978-90-481-2665-1. ^ Sample, Ian (August 30, 2007). "Global food crisis looms as climate change and population growth strip fertile land". The Guardian. ^ Smith, Kate & Edwards, Rob (March 8, 2008). "2008: The year of global food crisis". The Herald (Scotland). ^ Panagos, Panos; Borrelli, Pasquale; Meusburger, Katrin; Yu, Bofu; Klik, Andreas; Lim, Kyoung Jae; Yang, Jae E.; Ni, Jinren; Miao, Chiyuan (2017-06-23). "Global rainfall erosivity assessment based on high-temporal resolution rainfall records". Scientific Reports. 7 (1): 4175. Bibcode:2017NatSR...7.4175P. doi:10.1038/s41598-017-04282-8. ISSN 2045-2322. PMC 5482877. PMID 28646132. ^ Borrelli, Pasquale; Robinson, David A.; Fleischer, Larissa R.; Lugato, Emanuele; Ballabio, Cristiano; Alewell, Christine; Meusburger, Katrin; Modugno, Sirio; Schütt, Brigitta (2017-12-08). "An assessment of the global impact of 21st century land use change on soil erosion". Nature Communications. 8 (1): 2013. Bibcode:2017NatCo...8.2013B. doi:10.1038/s41467-017-02142-7. ISSN 2041-1723. PMC 5722879. PMID 29222506. ^ Potter, Kenneth W.; et al. (2004). "Impacts of agriculture on aquatic ecosystems in the humid United States". In DeFries, Ruth S.; et al. (eds.). Ecosystems And Land Use Change. American Geophysical Union. p. 34. ISBN 978-0-87590-418-4. ^ Da Cunha, L.V. (1991). "Sustainable development of water resources". In Bau, João (ed.). Integrated Approaches to Water Pollution Problems: Proceedings of the International Symposium (SISIPPA) (Lisbon, Portugal 19–23 June 1989). Taylor & Francis. pp. 12–13. ISBN 978-1-85166-659-1. ^ Merrington, Graham (2002). "Soil erosion". Agricultural Pollution: Environmental Problems and Practical Solutions. Taylor & Francis. pp. 77–78. ISBN 978-0-419-21390-1. ^ Majewski, Michael S. & Capel, Paul D. (1996). Pesticides in the Atmosphere: Distribution, Trends, and Governing Factors. CRC Press. p. 121. ISBN 978-1-57504-004-2. ^ Science Daily (1999-07-14). "African Dust Called A Major Factor Affecting Southeast U.S. Air Quality". Retrieved 2007-06-10. ^ Nowell, Lisa H.; et al. (1999). Pesticides in Stream Sediment and Aquatic Biota: Distribution, Trends, and Governing Factors. CRC Press. p. 199. ISBN 978-1-56670-469-4. ^ Shao, Yaping (2008). "Wind-erosion and wind-erosion research". Physics and Modelling of Wind Erosion. Springer. p. 3. ISBN 978-1-4020-8894-0. ^ U. S. Geological Survey (2006). "Coral Mortality and African Dust". Retrieved 2007-06-10. ^ James K. B. Bishop; Russ E. Davis & Jeffrey T. Sherman (2002). "Robotic Observations of Dust Storm Enhancement of Carbon Biomass in the North Pacific". Science 298. pp. 817–821. Archived from the original on 2010-11-19. Retrieved 2009-06-20. ^ Evans, R (2012). "Assessment and monitoring of accelerated water erosion of cultivated land – when will reality be acknowledged?". Soil Use and Management. 29 (1): 105–118. doi:10.1111/sum.12010. ^ Blanco, Humberto & Lal, Rattan (2010). "Modeling water and wind erosion". Principles of Soil Conservation and Management. Springer. ISBN 978-90-481-8529-0. ^ See also: Shai, Yaping (2008). Physics and Modelling of Wind Erosion. Springer. ISBN 978-1-4020-8894-0. and Harmon, Russell S. & Doe, William W. (2001). Landscape Erosion and Evolution Modeling. Springer. ISBN 978-0-306-46718-9. ^ Brazier, R.E. ; et al. (2011). "Scaling soil erosion models in space and time". In Morgan, Royston P.C. ; Nearing, Mark (eds.). Handbook of Erosion Modelling. John Wiley & Sons. p. 100. ISBN 978-1-4051-9010-7. ^ Ward, Andrew D. & Trimble, Stanley W. (2004). "Soil conservation and sediment budgets". Environmental Hydrology. CRC Press. p. 259. ISBN 978-1-56670-616-2. ^ Panagos, P.; et al. (2015). "Rainfall Erosivity in Europe". Sci Total Environ. 511: 801–814. Bibcode:2015ScTEn.511..801P. doi:10.1016/j.scitotenv.2015.01.008. PMID 25622150. ^ Panagos, Panos; Meusburger, Katrin; Ballabio, Cristiano; Borrelli, Pasqualle; Alewell, Christine (2014). "Soil erodibility in Europe: A high-resolution dataset based on LUCAS". Science of the Total Environment. 479-480: 189–200. Bibcode:2014ScTEn.479..189P. doi:10.1016/j.scitotenv.2014.02.010. PMID 24561925. ^ Panagos, P.; Borrelli, P.; Meusburger (2015). "A New European Slope Length and Steepness Factor (LS-Factor) for Modeling Soil Erosion by Water". Geosciences, MDPI. pp. 117–126. Bibcode:2015Geosc...5..117P. doi:10.3390/geosciences5020117. ^ Panagos, Panos; Borrelli, Pasquale; Meusburger, Katrin; Alewell, Christine; Lugato, Emanuele; Montanarella, Luca (2015). "Estimating the soil erosion cover-management factor at the European scale". Land Use Policy. 48: 38–50. doi:10.1016/j.landusepol.2015.05.021. ^ Panagos, Panos; Borrelli, Pasquale; Meusburger, Katrin; Zanden, Emma H. van der; Poesen, Jean; Alewell, Christine (2015). "Modelling the effect of support practices (P-factor) on the reduction of soil erosion by water at European scale". Environmental Science & Policy. 51: 23–34. doi:10.1016/j.envsci.2015.03.012. ^ Boardman, J.; Poesen, J. (2006). "Soil erosion in Europe: major processes, causes and consequences". Soil Erosion in Europe. Wiley, Chichester. pp. 479–487. doi:10.1002/0470859202. ISBN 9780470859209. ^ Jetten, V.; Favis-Mortlock, D. (2006). "Modelling soil erosion in Europe". Soil Erosion in Europe. Wiley, Chichester. pp. 695–716. doi:10.1002/0470859202. ISBN 9780470859209. ^ Favis-Mortlock, D. (1998). "Validation of field-scale soil erosion models using common datasets". Modelling Soil Erosion by Water. Springer-Verlag NATO-ARS Series 1–55, Berlin. pp. 89–128. ^ Jetten, V.; De Roo, A.P.J. ; Favis-Mortlock, D.T. (1999). "Evaluation of field-scale and catchment scale soil erosion models". Catena. 37 (3–4): 521–541. doi:10.1016/s0341-8162(99)00037-5. ^ Karydas, Christos G.; Panagos, Panos (2018). "The G2 erosion model: An algorithm for month-time step assessments". Environmental Research. 161: 256–267. Bibcode:2018ER....161..256K. doi:10.1016/j.envres.2017.11.010. PMC 5773245. PMID 29169100. ^ Connor, David J.; et al. (2011). Crop Ecology: Productivity and Management in Agricultural Systems. Cambridge University Press. p. 351. ISBN 978-0-521-74403-4. ^ For an interesting archaeological/historical survey of terracing systems, see Treacy, John M. & Denevan, William M. (1998). "The creation of cultivable land through terracing". In Miller, Naomi A. (ed.). The Archaeology of Garden and Field. University of Pennsylvania Press. ISBN 978-0-8122-1641-7. ^ Forman, Richard T.T. (1995). "Windbreaks, hedgerows, and woodland corridors". Land Mosaics: The Ecology of Landscapes and Regions. Cambridge University Press. ISBN 978-0-521-47980-6. ^ Johnson, R.J.; et al. (2011). "Global perspectives on birds in agricultural landscapes". In Campbell, W. Bruce; Ortiz, Silvia Lopez (eds.). Integrating Agriculture, Conservation and Ecotourism: Examples from the Field. Springer. p. 76. ISBN 978-94-007-1308-6. ^ Udawatta, Ranjith P. & Shibu, Jose (2011). "Carbon sequestration potential of agroforestry practices in temperate North America". In Kumar, B. Mohan & Nair, P.K.R. (eds.). Carbon Sequestration Potential of Agroforestry Systems: Opportunities and Challenges. Springer. pp. 35–36. ISBN 978-94-007-1629-2. ^ Blanco, Humberto & Lal, Rattan (2010). "Wind erosion". Principles of Soil Conservation and Management. Springer. p. 69. ISBN 978-90-481-8529-0. ^ Nair, P.K.R. (1993). An Introduction to Agroforestry. Springer. pp. 333–338. ISBN 978-0-7923-2135-4. ^ Lal, Rattan (1995). Tillage Systems in the Tropics: Management Options and Sustainability Implications, Issue 71. Food and Agriculture Organization of the United Nations. pp. 157–160. ISBN 978-92-5-103776-8. ^ See also: Gajri, P.R. ; et al. (2002). Tillage for sustainable cropping. Psychology Press. ISBN 978-1-56022-903-2. and Uri, Noel D. (1999). Conservation Tillage in United States Agriculture. Psychology Press. ISBN 978-1-56022-884-4. ^ Curran, W. (2016). "Cover Crops for Conservation Tillage Methods". Penn State University. Retrieved December 1, 2016. ^ "Soil Management on Potato Land". Government of Manitoba. 2016. Retrieved December 1, 2016. ^ "The Advantages of the Fibrous Root & Taproot Systems". Retrieved 2016-12-01. Boardman, John; Poesen, Jean (2006). Soil erosion in Europe. Wiley. ISBN 978-0-470-85910-0. Montgomery, David (October 2, 2008). Dirt: The Erosion of Civilizations (1st ed.). University of California Press. ISBN 978-0-520-25806-8. Montgomery, David R. (2007) Soil erosion and agricultural sustainability PNAS 104: 13268-13272. Brown, Jason; Drake, Simon (2009). Classic Erosion. Wiley. Vanoni, Vito A., ed. (2006). "The nature of sedimentation problems". Sedimentation Engineering. ASCE Publications. ISBN 978-0-7844-0823-0. Mainguet M. & Dumay F., 2011. Fighting wind erosion. One aspect of the combat against desertification. Les dossiers thématiques du CSFD. N°3. May 2011. CSFD/Agropolis International, Montpellier, France. 44 pp. "Soil Erosion by Water - Wikibooks, open books for an open world". en.wikibooks.org. Retrieved 2018-10-24.